PYT is an English speaking youth theatre for native and non-native English speakers, aged from 3-17. We empower young people to connect with one another, develop confidence, and create impactful stories. Prague Youth Theatre, established in 2011, is designed to give young people the chance to perform in full-scale productions, and provides an opportunity for students to develop a shared sense of confidence, commitment and self-expression. 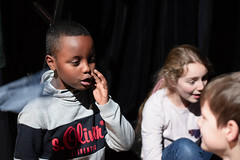 More than just a fun activity for kids, our theatre courses provide life-long skills and experiences for children in Prague of all nationalites and backgrounds.